Recently a visitor to my site referred me to an article on another dog site. The article keeps touting the fact that flaxseed oil contains high quantities of Omega-3s and how much dogs can benefit from the oil. What the article fails to do is to mention all the caveats, leaving readers (including the visitor who referred me to the article) the impression that flaxseed oil is an excellent oil to be given daily to dogs. The visitor asked me, "So can I give flaxseed oil to my dogs instead of fish oil?" Flaxseed oil is a plant oil, and while it is true that it contains more "Omega-3 fatty acids" than fish oil, the Omega-3 in flaxseed oil is in the form of ALA (alpha-linolenic acid), which is inactive and is a precursor to EPA and DHA (the active forms of Omega-3s). Unfortunately, the dogs' bodies are not effective when it comes to converting ALA to EPA and DHA. So if you feed flaxseed oil to dogs, chances are only very small amounts of EPA and DHA will be available to the dogs. In addition, flaxseed oil also contains Omega-6s. While dogs also need Omega-6s, most commercial dog foods contain an over-abundance of these fatty acids because they are, for one thing, relatively more stable compared to Omega-3s. The problem is, too much Omega-6s is not good for our dogs. The optimal ratios of Omega-6 to Omega-3 range between 10:1 and 5:1. Now, if we feed our dogs a commercial dog food (which in general is high-carb and grain-based) AND flaxseed oil, chances are the flaxseed oil will tip the balance and our dogs will have too much Omega-6s in the bodies. But isn't it true that Omega-3 is anti-inflammatory? If so, then flaxseed oil should be good for our dogs, right? Again, the Omega-3s that have anti-inflammatory properties are the EPA and DHA; so while the Omega-3s in fish oil are anti-inflammatory, the ALA in flaxseed oil is not. Flaxseed Oil for Dogs - What Do the Experts Say? "EPA and DHA from fish oil and other marine sources are far better sources of omega-3s for dogs than plant-based ALA... Therefore, they should consume EPA and DHA directly to gain maximum benefit." (Dr. Dodds, D.V.M., author of Canine Nutrigenomics - The New Science of Feeding Your Dog for Optimum Health). "While flaxseed oil has been suggested as a substitute for fish oil, there is no evidence that it is effective when used for the same therapeutic purposes as fish oil." (Shawn Messonnier, D.V.M., author of The Allergy Solution for Dogs). "Although flaxseed oil is often touted as a substitute for fish oil, new studies show it's not a reliable alternative and, in fact, can be harmful. According to the study published in 'American Journal of Clinical Nutrition' flaxseed oil is found very less effective against inflammatory conditions." (Paul Jacobson, Pet Food Nutritionist). 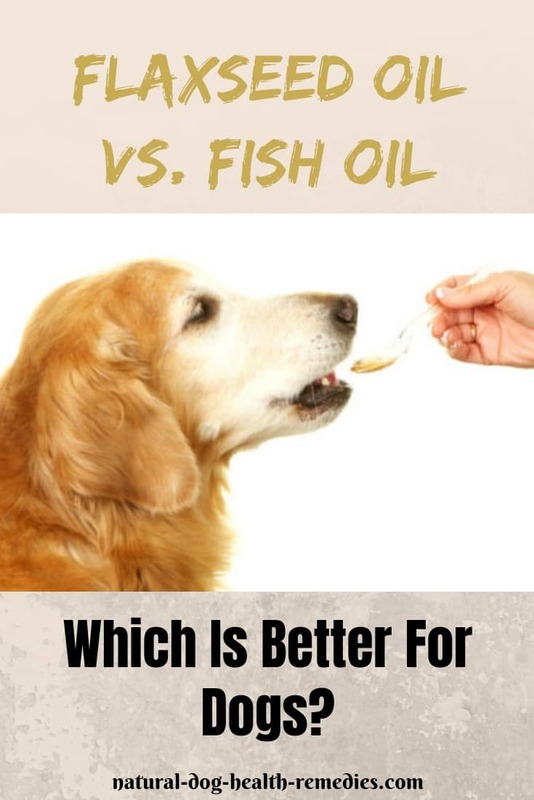 "...flaxseed oil provides limited benefits for most dogs, although it may help with dull, dry coat in some dogs... No plant oil can replace the need for fish oil (or fatty fish) in the diet." (Mary Straus, in an article published in the Whole Dog Journal, November 2012). "In feeding experiments, dogs receiving only flaxseed oil and commercial pet food suffered from bone and skeletal problems. When fish oil replaced the flaxseed oil, these problems disappeared." (C.J. Puotinen, author of Natural Remedies for Dogs and Cats). As you can see, on the surface, the cheaper flaxseed oil may seem like an attractive alternative to the more expensive fish oil, but if you investigate further, you will realize that it is not so simple! But Is Flaxseed Oil Good For Dogs At All? It is commonly agreed that flaxseed oil can improve the coat and skin conditions of some pets. In addition, when mixed with cottage cheese (Budwig diet), flaxseed oil may help dogs with cancer. So yes, flaxseed oil does have some limited benefits to dogs. How about lignans in flaxseeds? Aren't lignans beneficial to dogs? You may ask. Lignans are beneficial (e.g. to dogs with Cushing's disease, or even for cancer prevention), but pure flaxseed oil does not contain lignans! Lignans are found in the flaxseed hulls. If you want to give your dog lignans, you should get flax hulls, instead of flaxseed oil. Flaxseed oil contains ALA, an inactive form of Omega-3s, and fish oil contains DHA and EPA, the active forms. While the DHA and EPA in fish oil have anti-inflammatory properties, the ALA in flaxseed oil does not. 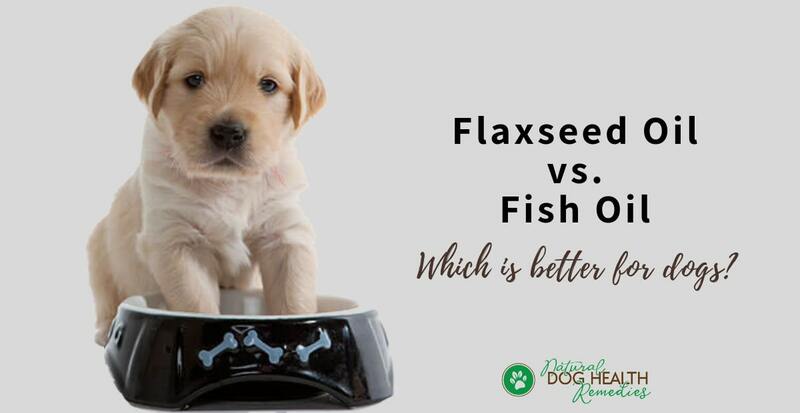 Dogs cannot convert ALA to DHA and EPA efficiently; therefore, flaxseed oil is not a good substitute for fish oil. Since flaxseed oil also contain Omega-6s, feeding flaxseed oil to dogs may overload the diet with Omega-6s, especially if the dog's diet is high carb and grain-based. Flaxseed oil does have limited benefits for dogs: When mixed with cottage cheese (Budwig diet), flaxseed oil may help dogs with cancer. The oil can also improve the coat and skin conditions of some pets (but so can fish oil). *If you want to know more about the various benefits of essential fatty acids for dogs, see this page.